Jesse Gilday’s clarinet playing has been described by the South Florida Classical Review as “carefully and beautifully shaped” and “precise.” Originally from Troy, NY, Mr. Gilday performs in Florida with the Charlotte Symphony Orchestra, Miami Lyric Opera, New World Symphony, Symphony of the Americas, The Villages Philharmonic Orchestra, and numerous chamber ensembles following his time in New York City as a freelance clarinetist. He performed on the 2018 Latin Grammy-nominated Sony/ATV Latin recording of Jorge Mejia’s An Open Book: A Memoir in Music. This summer, Mr. Gilday will perform at International Clarinet Association’s ClarinetFest for the third time, where he and Duo Electrique colleague Claire Grellier of Four Play Clarinet will premiere works for clarinet and bass clarinet. Jesse is also a past finalist in the ICA Orchestral Audition Competition. 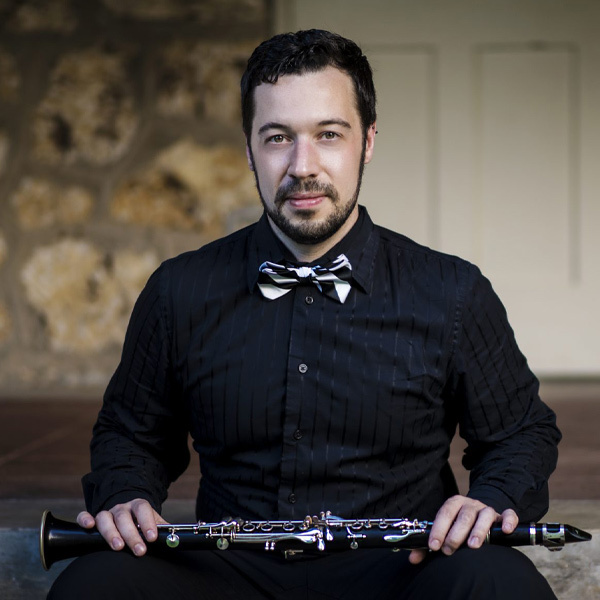 Mr. Gilday is the clarinetist for the NODUS Ensemble, the contemporary chamber music ensemble-in-residence at Florida International University, where he serves as clarinet faculty. He is a teaching artist at Miami Music Project, a non-profit educational organization inspired by the Venezuelan program El Sistema, which advocates social change through music. Passionate about the education of young musicians, Mr. Gilday also teaches woodwinds for the Greater Miami Youth Symphony and conducts clarinet and woodwind workshops and master classes for South Florida high school band programs. During the summer, he serves as clarinet faculty for the Killington Music Festival in Vermont. Mr. Gilday is currently a doctoral candidate at the University of Miami – Frost School of Music, where he holds a Henry Mancini fellowship and served as doctoral teaching assistant. At the Frost School, he has performed with Grammy winner Jorge Mejia and Emmy winner Jeff Beal, House of Cards composer. Mr. Gilday holds degrees from New York University, Baylor University, and Gordon College. His clarinet teachers include Margaret Donaghue Flavin, Pascual Martinez-Forteza, Richard Shanley, Alan Olson, William Kirkley, and Dennis Smylie. Mr. Gilday is also a five-time world-qualifying Irish dancer and site director of the Niall O’Leary School of Irish Dance – Miami.